Read this white paper to find out how your business can take advantage of world-class reporting, analysis, dashboards and visualization capabilities for more data-driven outcomes. Companies can now deliver centralized and reliable insights without spreading data across desktops and devices. 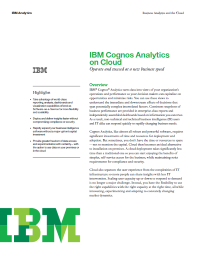 IBM® Cognos® Analytics uses enterprise-class reports and independently assembled dashboards to provide current views of your business so decision-makers can accelerate delivery and improve operational efficiencies.